I love God’s Word. I find it fascinating and adventurous, life changing and transformational. I have spent over a decade asking the Lord to use me to show other women how fun reading the Bible can be. In my work, I often discover that time spent alone with God in the Word is a real challenge for most people. 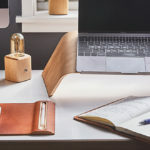 For years I assumed it was busyness that kept them from diving in to the Word, but lately I have come to realize it is something bigger than busyness. For most women, it comes down to not understanding what they are reading. Eventually, guilt, discouragement, or fear set in. The only thing I did know was that the Lord was prompting something within me, so I decided to obey. Later that day I created a post on Facebook asking if anyone would want to join in on a Facebook Live study of the Book of Matthew twice a week. We would discuss one chapter at a time for 15 minutes on Tuesday and Thursday mornings at 5:45 a.m. I would use the study to teach interested women how I study the Bible and what resources are out there. We would stop when we saw a name and discuss who that person was or where the town was on a map. I was hoping for 12 women to say yes, but to my overwhelming surprise I immediately had over 200 women ask to join. Before the group started, I asked everyone to purchase a good study Bible, a commentary, and a map of Israel. Women began sending me private messages, asking what a study Bible was. So many women were scared of commentaries. They had grown up in churches that discussed these tools, but they had never touched one themselves. But something about my asking them to purchase one helped move them out of their comfort zone. Our local LifeWay store grew so busy helping women pick out these new books that several employees began to question what this was for. This was the first win—getting unfamiliar tools into the hands of women. How exciting! The first assignment was to study the background of Matthew and chapter one (the genealogy). The challenge I faced was to draw something out of these two lessons that these modern-day women could relate to. I wanted to show them that we could relate to 2,000-year-old male writers who lived halfway across the world. Easy enough. My goal was to teach them that they could learn to apply truth from something as simple as the introduction to a book or as boring as a genealogy (just being real!). Then maybe they would start looking for the same relatable lessons throughout the rest of the study. What God did in that first broadcast was something special. He took a mother of two in her pajamas on her cell phone and birthed a Bible study community. 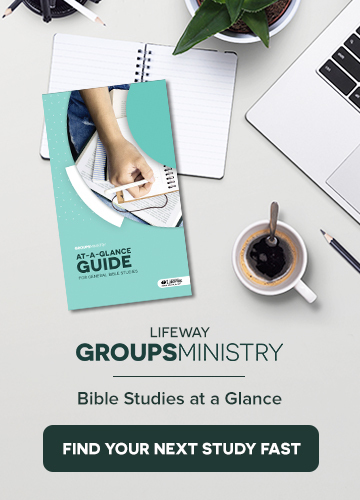 Coming next week: three crucial elements in a women’s Bible study group. Carrie Hunt lives in Orange, Texas, with her husband, Newly, and two girls, Eden (5) and Salem (3). Serving as Small Group coordinator at her church, Bridge Point Fellowship, she focuses on equipping leaders with the practical skills of discipleship and encouraging parents to teach their children how to be followers of Christ in the home. 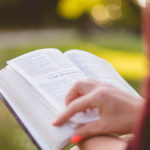 Carrie’s Facebook Live Bible study for women, “Becoming a Bible Nerd,” can be found at facebook.com, and you can follow Carrie on Twitter at @carriebakerhunt. Does Your Small Group Give a Glimpse of Heaven? Obedience to God’s prompting has changed the lives of so many women and their walk with God and the understanding and study of His word. This Bible study group has been a lifeline for me and keeping me in the Word. I live that it’s there for me any time if I can’t watch it live. God bless you Carrie Hunt. Love my BibleNerds & Carrie Hunt! I am one of those who had NO CLUE about how to read, let alone study my Bible! This group was the encouragement I needed to know that I wasn’t alone! & my best friends had the same fears as me & I had no idea! Keep it up, Carrie! You’re a Rock Star! This is a remarkable young woman making a big difference in our community. Her time and talents are such a gift to everyone that watches. Thank you Carrie Hunt for your commitment to the Lord and the blessings we receive from it. I am a member of this study group and I am so proud to be a part of it. I’m learning how to read on my own and I’m able to teach others in my family. I look forward to my days with the Bible which is so different from a year ago. I dreaded reading the Bible because I didn’t understand it and I felt like a “bad” Christian. I can feel my relationship with God getting stronger. This group has completely changed me. It is amazing to witness the passion and growth of the “Becoming a Bible Nerd” group. This group is revolutionizing how “normal” Christians read The Word. This study group and this woman have made a great impact on me. It’s my first time using some of these tools and it is amazing the difference in my quiet time! Carrie is a gifted teacher and a wonderful example of a true woman of God. I look forward to her videos every Tuesday and Thursday. I am so proud to call Carrie my friend, teacher, and study partner. She’s such an inspiration!! I just joined this Bible study and have already learned so much. I’m excited to get up early in the mornings and study my Bible and commentary and even more excited to listen to Carrie live on Tuesdays and Thursdays, making these scriptures so much more understandable and relevant to my personal life. I just joined Becoming a Bible Nerd on Facebook in time to be a part of the study of Acts. I do not know Carrie personally, but she is awesome. This is the first time I have ever done an “online” bible study, but Carrie keeps my attention. In fact, at the end of the 15 minutes I’m sitting there thinking “Oh No! It’s over.” I could listen to her for hours. I had never touched a commentary before I joined this group and now here I am with my bible, my commentary, my notebook and my sticky notes…I have several different colored pens and highlighters…LOL! It is so much fun and so informative. I have quit my book club so that I can put more focus on Becoming a Bible Nerd. I don’t have enough nice things to say about Carrie and all the other ladies in the group. I am determined to be a Bible Nerd! Thanks Carrie and everyone else that is helping me in this journey. Carrie is so genuine and on fire for the Gospel of Jesus!!! I love that she has lit the fire in me to dive into the bible!!! For me too, a busy mother I used my schedule as an excuse. But when it came down to it. I would try to read and it was over my head. I love her heart and am grateful that she stepped out and obeyed the Holy Spirit. This is a wonderful Bible study. It is indepth and eye opening in so many ways. Carrie does a beautiful job of making the Word of God come alive right before your eyes. By far, this has been my favorite study ever! My interest was sparked when our church offered seamless “small group” bible study by Angie Smith (if you haven’t done it…DO IT NOW!! She’s awesome!) which was also lead by Carrie Hunt who has a unbelievable way of teaching scripture to any age & making it understandable. I know this because she has also taught by 2 older boys at the ages of 9-12 that were able to come open & tell me things about the Bible I had no idea about!!! I can not say enough about the “becoming a bible nerd” FB group but I do know that through carrie the Bible is coming more alive than ever to me & the relationship between God & I is unexplainable because I’m truly understanding what He has done & is doing for me now!!! Most importantly for putting carrie in my life not only as a teacher but a close personal unbelievable friend! Go join now….you won’t regret it!!! Carrie, along with the entire group, are constantly inspiring. There’s a continuous desire for more and we dig deeper. There’s encouragement for becoming a Bible nerd. I personally am truly thankful for not just my friendship with Carrie, but for her spiritual gift and genuine desire to reach every heart possible for a love of God. Through Carrie’s bible study I have started really reading (and understanding) the Bible for the first time in my life. She make what seems overwhelming and intimidating easy to understand. I am so thankful for the spark this has ignited in both my husband and myself as we start to discover our faith all over again through the word! When we are obedient in small ways, God makes BIG things happen! That’s what Carrie has proven, first with her passion, then with her obedience. She began by wanting to teach a “few,” but God has “enlarged [her] territory” to a global audience of those hungry to understand God’s Word as they learn to read & cherish it! God is doing a mighty work in our community, our state, our country, & our world, beginning in the hearts of women just like Carrie Hunt! What’s so great about #becomingabiblenerd is that it’s not a study on just one topic. Carrie is really trying to help people understand how to read and understanding the whole word of God. His word is accessible and relevant to everyone – not just authors and pastors. If we can read and understand his word we begin to have a fuller grasp of who it is we serve. Rather than letting someone else direct us though scripture (which isn’t always bad) we are able to see more clearly the whole picture and to be led by the Holy Spirit. Becoming a biblenerd is life changing, knowing how to study Gods word makes it become alive!!! I am so hungry for knowledge. I am one women who always wanted to read the word, but never knew where to start or what any of it even meant. I am so blessed, thankful & grateful that one God led me to this home of Christians who believe just like me, but lead very normal lives as well, but most importantly I’m even more thankful that Carrie stepped out of her comfort zone and is helping all of us women learn the word and how to study it along with her team she has that help her and study with her also. Carrie Hunt and her #biblenerd team are inspiring, encouraging, and life-changing. I am here to testify that this study has been like a workout group for my spiritual fitness. I work better if I know I’m being accounted for. This group keeps me on track, motivated, and energized to grow spiritually every week & with every new chapter! So often we ignore that Holy Spirit whisper to our soul, we push it away with a million excuses… Carrie is not just teaching the Bible… she’s showing women that listening to that whisper, ignoring the excuses and just taking a step in faith can lead to amazing, life-changing results! Carrie’s #becomingabiblenerd live Facebook group has developed into a community of women and men who are digging deeper into God’s word, sharing what they’ve learned & are learning even more from others who share. It’s awe inspiring to be a part of it all. Carrie’s lessons on Tuesdays & Thursdays are anointed gifts that add so much clarity & tie each chapter up like a beautiful bow. She herself is an inspiration to so many and her love for God’s Word is contagious! So many, like myself, now have a passion for not only reading but studying the Bible because of her! So excited to have joined this group and for all I hope to learn from it! It’s amazing to see how God is using Carrie to reach so many women in our community and throughout the United States as she teaches us how to dig deeper into our bibles. We are gaining a great understanding of how to read and understand the Bible and in doing so developing deeper relationship with Christ. God has big plans and I am so glad Carrie trusted God and took that first step. Carrie is a blessing to all who know her. Thank you Carrie for your devotion and psssion for Christ and his word.